Unless you and your partner are exactly the same size it’s unlikely you can both use this carrier. You’d have to buy two – one for you and one for them. Likewise it might not be possible to share this carrier with anyone else who might carry your baby – grannies, granddads, aunts, nannies etc. While this can be a great carrier if you do have the right size for you, many people find they fall between sizes. Or outside the sizing. K’Tan actually make a total of 6 sizes, however, at the time of writing this only 3 of these seem to be readily available in the UK. Small, Medium and Large which apparently correspond to dress sizes 8-10, 12-14 and 16-18 respectively. But in practise many people who follow this guide still find they end up with a carrier that is slightly too small or slightly too big and as a result can not use the carrier at all. If your size changes significantly you may find the carrier no longer fits you. This might sound unlikely but it’s very common to gain or lose weight quite a bit of weight in the months after birth. Women’s bodies change loads in the postpartum period and men may find their body shape changes too with the new routine (my marathon running husband put about 8-10 kilos on in the months after the birth of each of our children until sleep and routine settled down enough for him to get back to running as much as he was pre-birth). 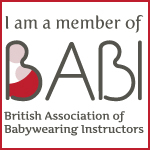 As baby’s size changes you might need to buy a new carrier or find that they no longer fit. In theory, because the K’Tan is made of stretchy fabric, baby’s size shouldn’t matter. Bigger children should simply stretch the carrier out more so that the same size carrier that fits the adult should worth whether carrying a newborn or a 1 year old. However, in practise this is not the case at all – the material just isn’t that stretchy at all and many parents report baby no longer fitting without sizing up. Ultimately, all these problems are solved by having a carrier that is adjustable rather than sized. I mean don’t get me wrong, if this carrier does fit you well – if you do have the right size, you don’t lose or gain lots of weight, your partner is the same size as you and your baby doesn’t grow too much (!) this is a really nice carrier. It gives a lovely snuggly fit that’s perfect for the newborn period and it’s really simple to use. But those are massive ifs, and the simple fact is there is another carrier on the market that does all the same things, that offers the same carrying position, offers the same ease of use, the same softness AND is adjustable. And really that is why I don’t recommend the Baby K’Tan – why spend £50 on a Baby K’Tan when you can buy the Close Caboo and have all the pros without the massive cons for £55?